I’ll do some bookbinding posts soon. For now, more poetry. Met a lion in the tree. The day was done; there’s an end to the year. High time, I think, to start again! 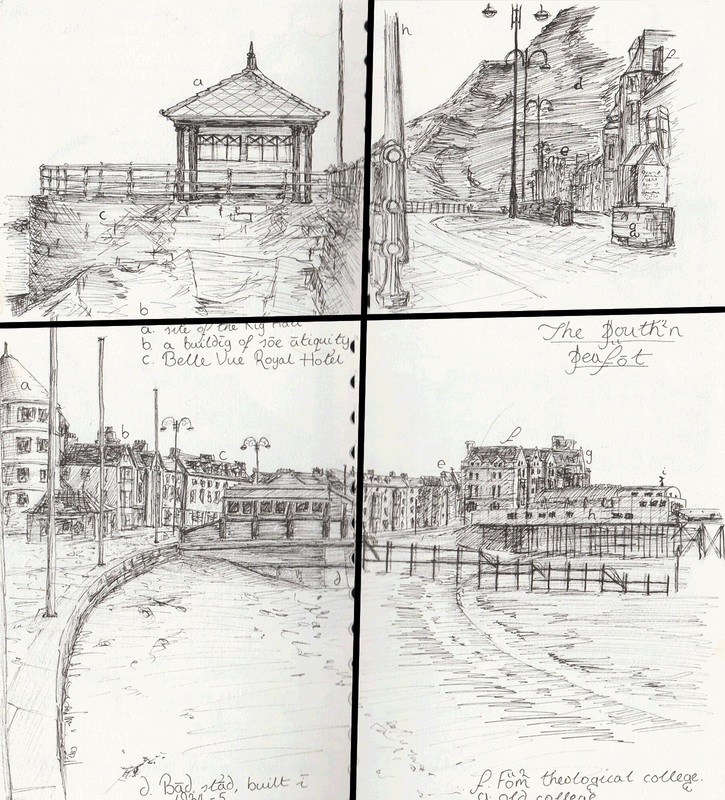 I was off out sketching today, and at the front of an old sketchbook I found a group of quick doodles I did a few years ago in Aberystwyth – put together, they were supposed to create a panoramic view of the seafront. If you click the image, it might just be easier to sea. I put together a tall tale about Danbury’s finest ghost story last Christmas, and this year (although I should and hope to put together a proper good old tale for this year’s fireside) I hope to drag on my incompetent prose with a short rhyme upon it. Basically I went for a foggy-sunset walk and some verses popped up, so here they are. Then tumbled out of view. But yet the bell remained. They found but empty snow. I’ve been doing a good deal of bookbinding recently, and finally seem to now have more books to work on than time to work on them. Owing to one of my bookshelves being against an outside wall, for the last week I’ve been trying to keep under control some mold among my books, which spread from a couple of battered old volumes that seem to have been kept somewhere damp in the past – the culprits for bringing mold into my collection in the first place. With that now solved, I decided to repair a disbound book that had been sandwiched among some of those unfortunate volumes – I pray, kind reader, that you enjoy the result. The book itself is the miscellaneous works of Samuel Butler, a poet and writer famous for his Hudibras – a satire set within the conflicts of the Civil War. This little volume I was working on also contained L’Estrange’s “Key to Hudibras” – and was the reason why I’d originally bought it, being a huge fan of L’Estrange’s works. I had some of my favourite leather left over for this book – a beautiful olive green. I did attempt to gild it using the traditional method of gold leaf and glaire, which I failed at completely, and resorted back to the easier way of gilding with foil.